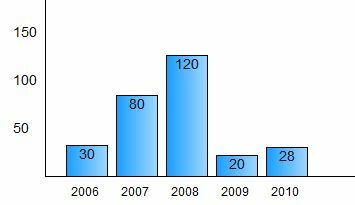 The histogram is a bar chart, but if the distribution is done over years, and so labels have the same size, it is possible to simplify the display, and it becomes unnecessary to change the color of bars. You can also use a texture for embellishing the bar, it will be assigned in the CSS code. Again, inserting the chart into a web page remains still simple and quick, and it's the goal here. The code is simplified by the removal of color values, we now only inserts into <li> tags the values and years. A value distribution is followed by the code ":" and then the year. It is immediately followed by the container for years. It is similar to the code of the bar graph with optional definition of an texture to the bars in the CSS descriptor for <li> tags. The demo also has code to change the colors if desired, but the colors are ignored when, as here, we have chosen to display the bars with a texture. Nothing else than the code included in the source of this page is required... Only the list of values is specific to the application.